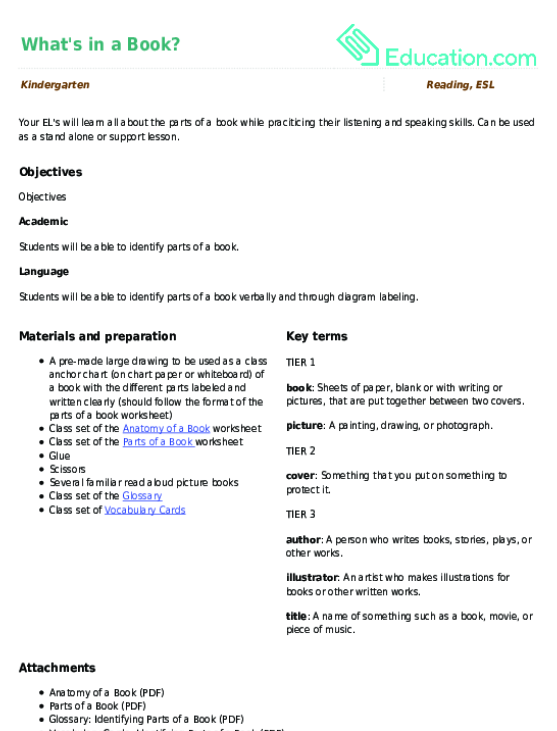 This lesson can be used as a pre-lesson for the Identifying Parts of a BookLesson plan. 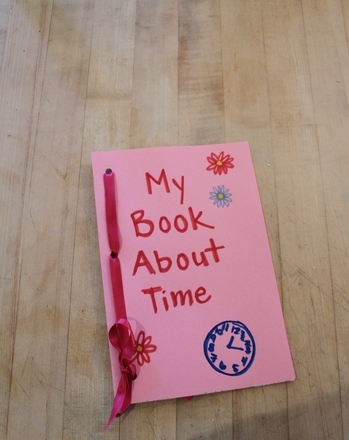 Book: Sheets of paper, blank or with writing or pictures, that are put together between two covers. Picture: A painting, drawing, or photograph. Cover: Something that you put on something to protect it. Author: A person who writes books, stories, plays, or other works. Illustrator: An artist who makes illustrations for books or other written works. Title: A name of something such as a book, movie, or piece of music. Students will be able to identify parts of a book. 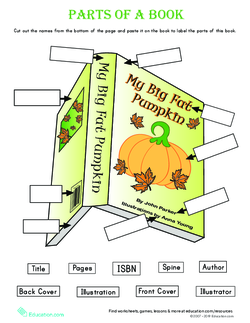 Students will be able to identify parts of a book verbally and through diagram labeling. Play a round of "head, shoulders, knees, and toes" with your students. Refer to the stack or books you selected for this lesson and say, "What do we call these? ""Allow students to say the word "books" aloud, and prompt them to say "books" as needed. Explain that just like we have different body parts (head, shoulders, knees, toes) books also have different parts. Tell your students that today they will be learning about the different parts of a book. 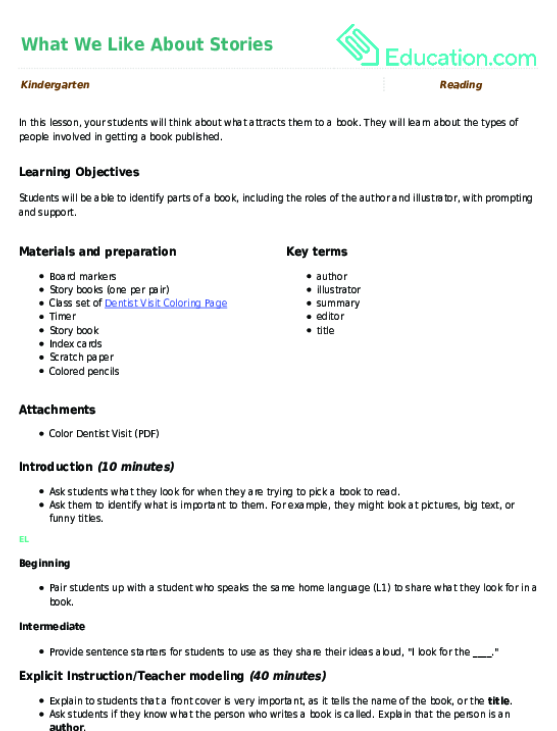 Display the pre-made labled class anchor chart of a book to the class. Group students in pairs and pass out one familiar book to each pair. Point to the different labels (one at a time) shown on both the labeled book and a real book (using modeling). 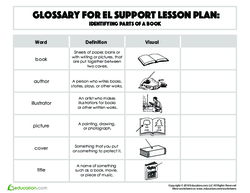 Say the term aloud, providing the student a friendly defition provided in the glossary. 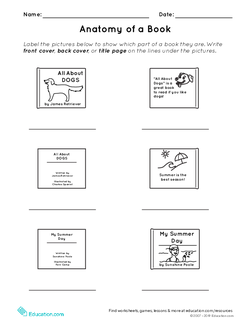 Ask the students to repeat each term and then find the matching part of the book using their own books, along with their partner. 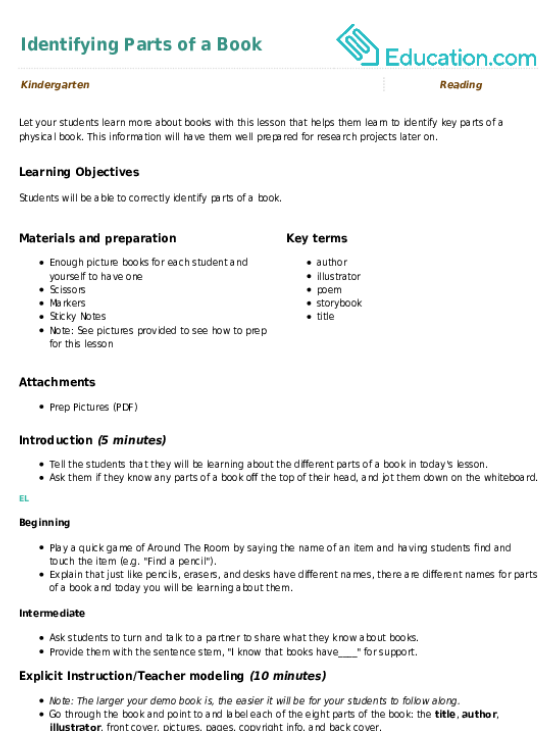 For example, "Here is the title on my book, can you find the title on your book and point to it?" Check that students are able to identify all the parts of the book, and correct students as needed. Hold up a book and ask students to bring their attention back to the front of the room and the book you are holding. Ask students to think about why it is important to know the different parts of a book by saying, "Why might I want to know who wrote this book?" Then, model thinking aloud by answering your question saying, "I could learn if the author wrote more stories like this one by knowing who the author is." 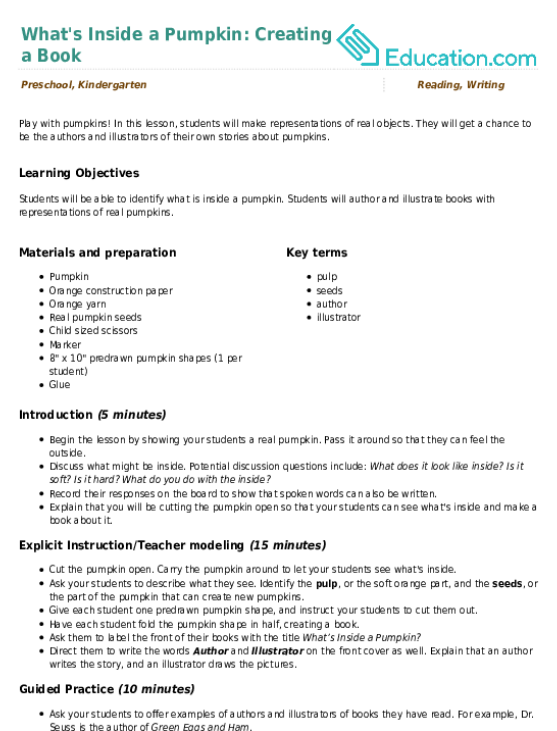 Repeat this process by asking questions about the title, illustrator, front/back cover, and spine (as time allows). Ask students to turn to a partner and think-pair-share using the sentence frame, "I could learn ____By knowing ____ about the book." Work with a small group of students to practise finding and verbally stating the different parts of a book, using real books as models. 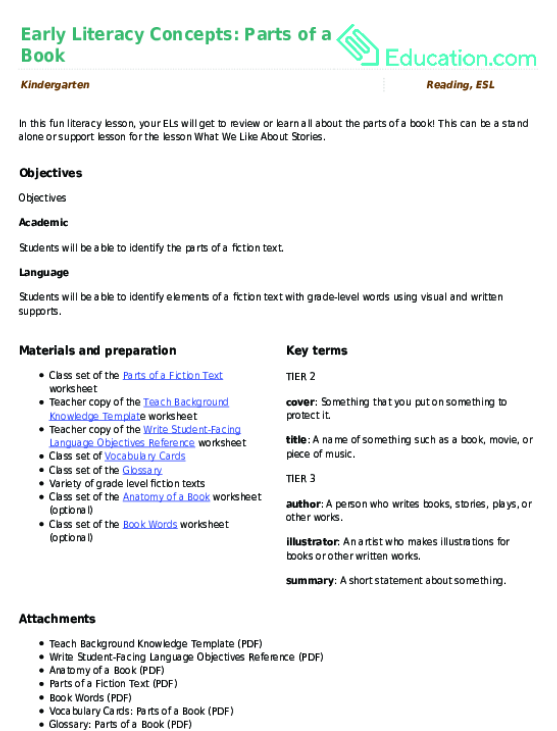 Have students complete the Anatomy of a Book worksheet and share it with a partner to check their work. 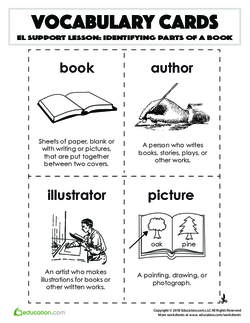 Pass out the Parts of a Book worksheet and have the students refer back to the class anchor chart to support them as they complete the worksheet independently. Assess whether students were able to accurately find and label each part of the book shown on the worksheet. Close the lesson by picking up a favorite class read aloud and saying, "It is so helpful to know the parts of this book! Now I can learn who drew the pictures, who wrote the words, and which side of the book to start reading!" In this lesson, students will make representations of real objects. They will get a chance to be the authors and illustrators of their own stories about pumpkins.